Phrenology heads or busts were used by phrenologists to perform "skull readings" that supposedly revealed information about a person's character and tendencies. During the late 1700s, a physician names Frances Gall proposed that the bumps on a person's head could be linked to their intellectual faculties and personality. While this is now viewed entirely as pseudoscience, phrenology actually became quite popular for a time. The phrenology head seen above shows a number of different regions of the brain linked to different personality characteristics. During a skull reading, a phrenologist would carefully feel the individual's head and make note of bumps and indentations. The phrenologist would compare these findings to that of a phrenology bust in order to determine what the surface of the skull had to say about the individual's natural aptitudes, character, and tendencies. Obviously, while phrenology heads and charts can be a fun and interesting way to look at a curious chapter in psychology's history, they are not something to be taken seriously. 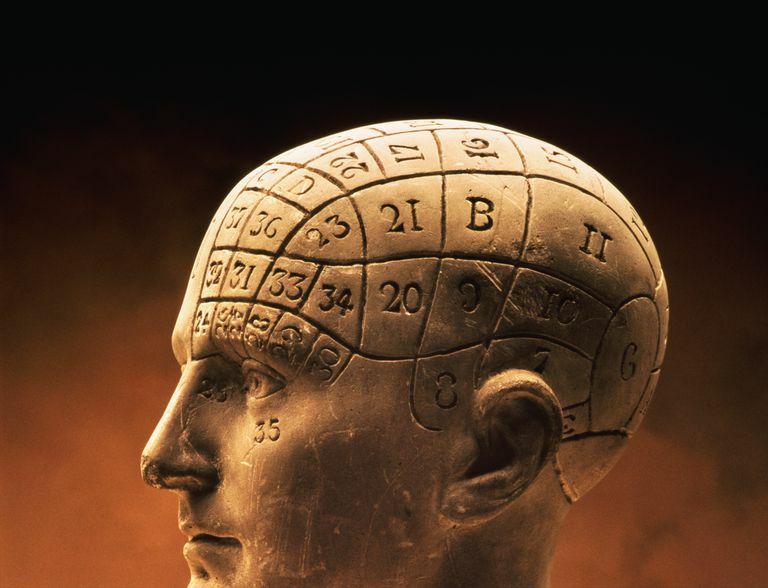 Scientists discredited phrenology by the mid-1800s, although phrenology readings continued to have moments of popularity during the late 1800s and early 1900s. While phrenology was eventually shown to be pseudoscience, the idea that certain abilities might be linked to specific areas of the brain did have an influence on the field of neurology and the study of the localization of brain functions. Today, phrenology is regarded as a pseudoscience along the same lines as palm reading and astrology.